The public supports tough measures – including the possible use of military force – to prevent Iran from developing nuclear weapons. Nearly six-in-ten (58%) say it is more important to prevent Iran from developing nuclear weapons, even if it means taking military action. Just 30% say it is more important to avoid a military conflict with Iran, even if it means that country develops nuclear weapons. These opinions are little changed from October 2009. There have been reports in recent weeks that Israel may soon attack Iran’s nuclear facilities. About half of Americans (51%) say the United States should remain neutral if Israel takes action to stop Iran’s nuclear program, but far more say the U.S. should support (39%) than oppose (5%) an Israeli attack. The latest national survey by the Pew Research Center for the People & the Press conducted Feb. 8-12, 2012, among 1,501 adults, finds substantial partisan differences over how to deal with Iran’s nuclear program. Republicans are far more supportive of using military force to prevent Iran from developing nuclear weapons than are either Democrats or independents. Moreover, a majority of Republicans (62%) say the U.S. should support an Israeli attack to stop Iran’s nuclear program, compared with just a third of independents and Democrats. There also is a wide partisan gap over President Obama’s plans for withdrawing U.S. forces from Afghanistan. Overall, 53% say Barack Obama is removing troops from Afghanistan at about the right pace. Just 20% say the president is withdrawing troops too quickly and 22% say he is not removing troops quickly enough. Last June, 44% said they thought Obama would handle the troop withdrawal about right, and 50% expressed this view in March 2o11. A plurality of Republicans (43%) now say that Obama is removing U.S. troops from Afghanistan too quickly; 30% say Obama is handling this about right while 21% say he is not removing the troops quickly enough. 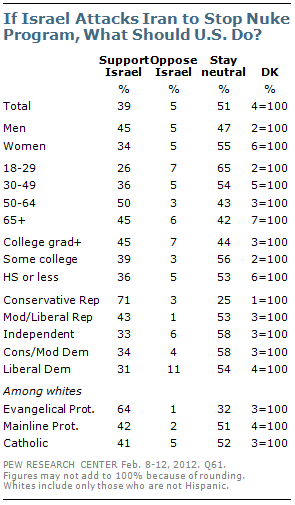 In June 2011, just 28% of Republicans thought Obama would remove the troops too quickly. An overwhelming majority of Democrats (77%) continue to say Obama is handling the troop withdrawal about right, an increase of 11 points from June 2011. Similarly, about half of independents (51%) think the president is handling the withdrawal of troops from Afghanistan about right, up from 40% in June. About a quarter (28%) of independents say Obama is not removing troops quickly enough and 17% say he is removing them too quickly. About half of Americans (51%) say the U.S. should stay neutral if Israel attacks Iran. Nearly four-in-ten (39%) say the U.S. should support Israel’s military action while just 5% say the U.S. should oppose military’s action. 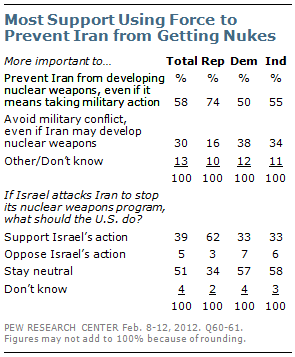 There are large demographic differences in views about what the U.S. should do if Israel attacks Iran. A majority of women (55%) say the U.S. should stay neutral. Men are more divided over whether the U.S. should stay neutral (47%) or support Israel (45%). Young people also are far more likely than older Americans to say the U.S. should stay neutral. Fully 64% of white evangelical Protestants say that the U.S. should support Israel if it attacks Iran in an effort to stop their nuclear weapon program. That compares with 42% of white mainline Protestants and 41% of white Catholics. There is a wide divide among Republicans on the issue of Iran. Fully 71% of conservative Republicans think the U.S. should support Israel’s military action if they attack Iran, compared with 43% of moderate and liberal Republicans. A majority of independents and Democrats (including both liberal and more moderate Democrats) think the U.S. should stay neutral. Overall, there has been modest attention to the dispute over Iran’s nuclear program; 38% say they have heard a lot while 39% have heard a little and 23% have heard nothing at all. That is comparable to attention paid to Iran’s nuclear program last month and in October 2009. Republicans (47%) are more likely than independents (38%) and Democrats (31%) to say they have heard a lot about the dispute over Iran’s nuclear program. And two-thirds (67%) of Republicans and Republican-leaning independents who agree with the Tea Party say they have heard a lot about Iran’s nuclear program. Despite the recent push for tougher economic sanctions against Iran by the U.S. and its allies, 64% of the public thinks that tougher economic sanctions will not work in getting Iran to give up its nuclear program. Just 21% think they will work. 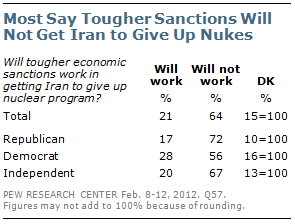 In October 2009, 56% thought tougher economic sanctions would not work in stopping Iran’s nuclear weapons program. There is wide consensus across party lines that tougher economic sanctions on Iran will be ineffective. Most Republicans (72%) and independents (67%), as well as 56% of Democrats, say that Iran will not give up its nuclear program even with tougher economic sanctions. An overwhelming majority of Republicans and Republican-leaning independents who agree with the Tea Party (84%) say that the U.S. should prevent Iran from developing nuclear weapons, even if it means taking military action. That compares with a smaller majority (64%) of Republicans who disagree with or have no opinion of the Tea Party. The gap among Republicans is even larger on what the U.S. should do if Israel attacks Iran to stop its nuclear weapons program. Fully 81% of Tea Party Republicans say the U.S. should support Israel’s military action, compared with just 43% of non-Tea Party Republicans. There also are differences among Republicans about how Obama is handling troop withdrawal from Afghanistan. A majority of Tea Party Republicans (61%) now say that Obama is removing troops too quickly. A year ago, when asked if Obama will remove U.S. troops too quickly, just 33% of Tea Party Republicans said he would remove troops too quickly and 35% said he would handle it about right. 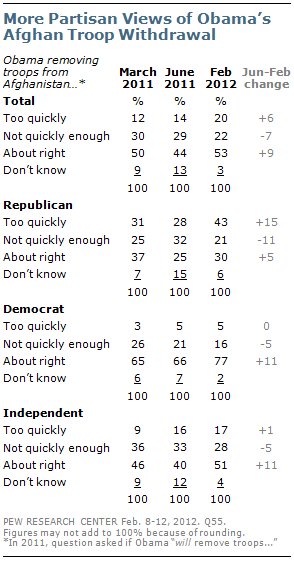 Far fewer non-Tea Party Republicans (27%) say Obama is removing troops too quickly. More say Obama is handling the troop withdrawal about right (38%). Views among non-Tea Party Republicans have changed little since last year.